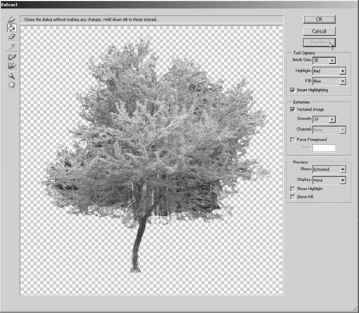 The Variations feature, which you find in the ImageOAdjustments menu, is a semi-automated way to make color and tonal adjustments to your images. You open the image, open Variations, and then click which version looks better. (See Figure 6-19). 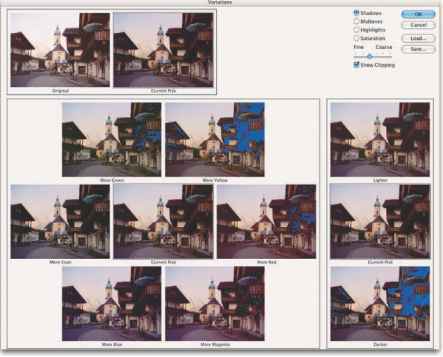 Figure 6-19: You use Variations to click your way to a perfect picture. Much like getting new eyeglasses, using Variations is a matter of "Which looks better, this or this? " When you click one of the images, it moves to the Current Pick position, and a new set of variations is automatically generated The blue areas that you see in some of the options in Figure 6-19 indicate areas where colors will be clipped — forced into black in the shadows or to white in the highlights — which results in a loss of detail in the image. You can disable that feature by clearing the Show Clipping check box in the upper right. Also note that you can adjust the shadows, midtones, and highlights independently, and you can also control (to some degree) the amount of variation from sample to sample. Start with the Fine/Coarse slider set somewhere in the middle and get reasonably close to a great image, correcting midtones, shadows, highlights, and then saturation. Now drag that slider to the Fine setting and zero in on a perfect image.